FILE - Russian Foreign Minister Sergey Lavrov, right, listens to Arab League Secretary-General, Ahmed Aboul Gheit, as he departs the Arab League headquarters after meetings, in Cairo, Egypt, Monday, May 29, 2017. Russia is lobbying the Arab League to re-admit Bashar al-Assad’s Syria as a member, say diplomats based in the region. The Kremlin is eager to re-legitimize Assad’s regime quickly, hoping that will help in the pursuit of funds to rebuild the war-shattered country and consolidate Assad’s grip on power. The Kremlin has been focusing its pro-Assad diplomacy on Egypt, the United Arab Emirates, Iraq and Saudi Arabia, aiming to pave the way for a re-admission at next month’s Arab League summit in Tunis. The issue of Syria's possible return to the Arab League isn’t currently on the agenda for the summit scheduled for March 31, but Russian diplomats behind-the-scenes have been urging their Arab counterparts to table it. The 22-nation Arab League suspended Syria's membership in 2011 in retaliation for the regime’s brutal repression of a mainly Sunni Muslim-driven popular uprising against Assad. Several Arab states recalled their ambassadors from Damascus. 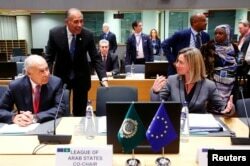 Arab League Secretary-General Ahmed Abul Gheit and EU foreign policy chief Federica Mogherini attend a joint meeting of European Union and League of Arab States foreign ministers in Brussels, Belgium, Feb. 4, 2019. Arab League re-admission isn’t the only issue being discussed in these high-level talks, say analysts, but an end to the conflict in Syria is key for a Kremlin determined to capitalize on Assad’s Russia-backed survival. It hopes to use Syria to restore Russia’s status and role as a major outside power in one of the world’s most volatile regions. Much of the Russian outreach is couched in terms of the fight against the Islamic State and other jihadist groups. Last week, Lavrov pledged Russia’s support for Iraq’s counter-insurgency operations against IS, which has resorted to hit-and-run guerrilla tactics in the wake of the loss of Mosul last year. “We are interested in actively helping you tackle this challenge. Let us discuss all these matters,” Lavrov told Mohammed Al Hakim, according to Russian media reports. In a bid to boost ties with Baghdad, Moscow has invested millions of dollars in Iraq’s energy sector and has opened an intelligence-sharing center in the Iraqi capital. Being the regional power-broker, as Russia now in effect has become, will test Moscow's juggling skills in a highly volatile corner of the world, say analysts. Moscow could end up trapped in a quagmire, if it can’t bring the conflict in Syria to a swift conclusion. And to do so, it has to satisfy the interests and demands of a complicated group of players, including Turkey and Israel. Russian President Putin is also trying to prevent a potential major military clash between Israel, another Western-allied power he’s been courting, and Iran in the south and west of the country. “Russia wants to reconnect Syria to global financial markets so Bashar al-Assad can consolidate his hold on power and begin accruing the $400 billion he believes is necessary for rebuilding Syria,” according to analyst Samuel Ramani in a commentary for the Carnegie Endowment for Peace, a Washington-based think tank.